pool, entertainment (16/6-31/8), kayaks, sanitary blocks with warm water and paper free, values’keeping, ferry booking, wi-fi, bicycles, infirmary freezer for cooling elements. washing chines’/dryer’s coins, fridge for hire, scooter for hire, medical visit. pool, entertainment (16/6-31/8), kayaks, sanitary blocks with warm water and paper free, cell. phones’ loading, values’keeping, ferry booking, wi-fi (where possible), bicycles. washing chines’/dryer’s coins, scooter for hire. Double bedroom + sleeping room with 3 single beds + living room with full equipped kitchen. 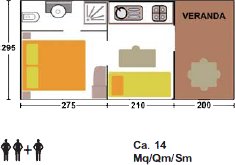 Bathroom ( WC, sink, bidet, shower, hairdryer), air-conditioning. Measures of the external veranda : 2,50 x 2,00 m.
pool, entertainment (16/6-31/8), kayaks, ferry booking, wi-fi (where possible), bicycles, values’keeping. washing chines’/dryer’s coins, scooter for hire, medical visit. 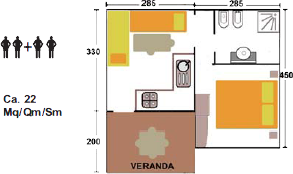 Double bedroom with bath room (WC, sink, shower) + living room with single couch bed. Full equipped kitchen, airconditioning. Measures of the external veranda : 2,95 x 2,00 mt. 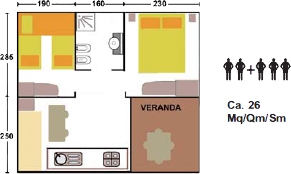 Double bedroom + living room with 2 single couch beds. Full equipped kitchen, bathroom (WC, sink, bidet, shower, hairdryer), air-conditioning. 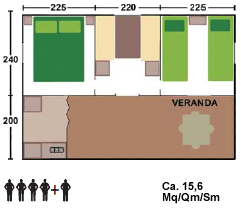 Measures of the external veranda : 2,85 x 2,00 m.